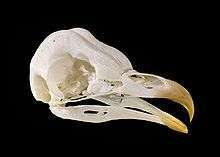 The beak, bill, or rostrum is an external anatomical structure of birds that is used for eating and for grooming, manipulating objects, killing prey, fighting, probing for food, courtship and feeding young. 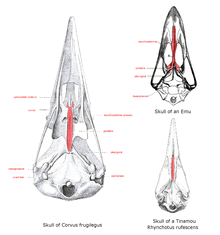 The terms beak and rostrum are also used to refer to a similar mouth part in some dicynodonts, Ornithischians (see Cephalopod beak), cetaceans, billfishes, pufferfishes, turtles, Anuran tadpoles and sirens. Birds from a handful of families—including raptors, owls, skuas, parrots, turkeys and curassows—have a waxy structure called a cere (from the Latin cera, which means "wax") which covers the base of their bill. This structure typically contains the nares, except in the owls, where the nares are distal to the cere. Although it is sometimes feathered in parrots, the cere is typically bare and often brightly colored. In raptors, the cere is a sexual signal which indicates the "quality" of a bird; the orangeness of a Montague's harrier's cere, for example, correlates to its body mass and physical condition. The cere color of young Eurasian scops-owls has an ultraviolet (UV) component, with a UV peak that correlates to the bird's mass. A chick with a lower body mass has a UV peak at a higher wavelength than a chick with a higher body mass does. 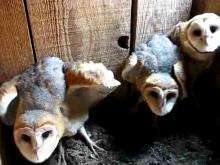 Studies have shown that parent owls preferentially feed chicks with ceres that show higher wavelength UV peaks, that is, lighter-weight chicks. 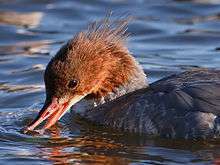 Rictal bristles are stiff hair-like feathers that arise around the base of the beak. They are common among insectivorous birds, but are also found in some non-insectivorous species. Their function is uncertain, although several possibilities have been proposed. 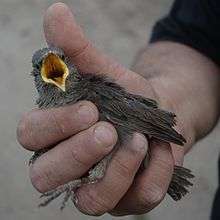 They may function as a "net", helping in the capture of flying prey, although to date, there has been no empirical evidence to support this idea. 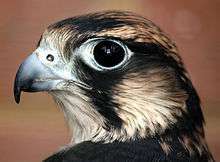 There is some experimental evidence to suggest that they may prevent particles from striking the eyes if, for example, a prey item is missed or broken apart on contact. They may also help to protect the eyes from particles encountered in flight, or from casual contact from vegetation. There is also evidence that the rictal bristles of some species may function tactilely, in a manner similar to that of mammal whiskers (vibrissae). Studies have shown that Herbst corpuscles, mechanoreceptors sensitive to pressure and vibration, are found in association with rictal bristles. 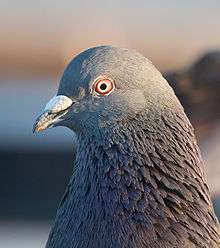 They may help with prey detection, with navigation in darkened nest cavities, with the gathering of information during flight or with prey handling. ↑ Partington, Charles Frederick (1835). The British cyclopæedia of natural history: combining a scientific classification of animals, plants, and minerals. Orr & Smith. p. 417. 1 2 3 Proctor and Lynch (1998), p. 66. ↑ "Beak". Merriam-Webster. Retrieved 1 July 2016. 1 2 Coues (1890), p. 147. ↑ Gill (1995), p. 149. ↑ Seki, Yasuaki; Bodde, Sara G; Meyers, Marc A; Meyers (2009). "Toucan and hornbill beaks: A comparative study" (PDF). Acta Biomaterialia. 6 (2): 331–343. doi:10.1016/j.actbio.2009.08.026. PMID 19699818. Archived from the original (PDF) on 2012-04-02. 1 2 Gill (1995), p. 148. ↑ Mayr, Gerald (2005). "A new eocene Chascacocolius-like mousebird (Aves: Coliiformes) with a remarkable gaping adaptation" (PDF). Organisms, Diversity & Evolution. 5: 167–171. doi:10.1016/j.ode.2004.10.013. 1 2 3 4 5 Campbell and Lack (1995), p. 47. ↑ Bonser RH & Mark S Witter (1993). "Indentation hardness of the bill keratin of the European Starling" (PDF). The Condor. 95: 736–738. doi:10.2307/1369622. ↑ Beddard, Frank E. (1898). The structure and classification of birds. London: Longmans, Green and Co. p. 5. ↑ Pitocchelli, Jay; John F. Piatt; Harry R. Carter (2003). "Variation in plumage, molt, and morphology of the Whiskered Auklet (Aethia pygmaea) in Alaska". Journal of Field Ornithology. 74 (1): 90–98. doi:10.1648/0273-8570(2003)74[90:VIPMAM]2.0.CO;2. ↑ Knopf, F. L. (1974). "Schedule of presupplemental molt of white pelicans with notes on the bill horn" (PDF). Condor. 77 (3): 356–359. doi:10.2307/1366249. ↑ Chernova, O. F.; Fadeeva, E. O. (2009). "The peculiar architectonics of contour feathers of the emu (Dromaius novaehollandiae, Struthioniformes)". Doklady Biological Sciences. 425: 175–179. doi:10.1134/S0012496609020264. 1 2 3 Stettenheim, Peter R. "The Integumentary Morphology of Modern Birds—An Overview" (PDF). Integrative and Comparative Biology. 40 (4): 461–477. doi:10.1093/icb/40.4.461. Archived from the original (PDF) on 2012-04-20. ↑ Klasing, Kirk C. (1999). "Avian gastrointestinal anatomy and physiology". Seminars in Avian and Exotic Pet Medicine. 8 (2): 42–50. doi:10.1016/S1055-937X(99)80036-X. ↑ Ferguson-Lees, James; Christie, David A. Raptors of the World. London: Christopher Helm. p. 66. ISBN 0-7136-8026-1. ↑ Harris, Tony; Franklin, Kim (2000). Shrikes and Bush-Shrikes. London: Christopher Helm. p. 15. ISBN 0-7136-3861-3. ↑ Gosner, Kenneth L. (June 1993). "Scopate Tomia: An Adaptation for Handling Hard-shelled Prey?" (PDF). The Wilson Bulletin. 105 (2): 316–324. ↑ Ornelas, Juan Francisco. "Serrate Tomia: An Adaptation for Nectar Robbing in Hummingbirds?" (PDF). The Auk. 111 (3): 703–710. ↑ Madge, Steve; Burn, Hilary (1988). Wildfowl. London: Christopher Helm. pp. 143–144. ISBN 0-7470-2201-1. ↑ Campbell and Lack (1995), p. 127. ↑ Coues (1890), p. 152. 1 2 Pyle, Peter; Howell, Steve N. G.; Yunick, Robert P.; DeSante, David F. (1987). Identification Guide to North America Passerines. Bolinas, CA: Slate Creek Press. pp. 6–7. ISBN 0-9618940-0-8. 1 2 Borras, A.; Pascual, J.; Senar, J. C. (Autumn 2000). "What Do Different Bill Measures Measure and What Is the Best Method to Use in Granivorous Birds?" (PDF). Journal of Field Ornithology. 71 (4): 606–611. JSTOR 4514529. ↑ Campbell and Lack (1995), p. 342. ↑ Mullarney, Svensson, Zetterström and Grant (1999), p. 357. ↑ Mullarney, Svensson, Zetterström and Grant (1999), p. 15. ↑ Campbell and Lack (1985), p. 254. 1 2 Howell (2007), p. 23. ↑ Russell, Peter J.; Wolfe, Stephen L.; Hertz, Paul E.; Starr, Cecie (2008). Biology: The Dynamic Science. Vol. 2. Belmont, CA: Thomson Brooks/Cole. p. 1255. ISBN 978-0-495-01033-3. ↑ Coues (1890), p. 155. ↑ Campbell & Lack (1985), p. 105. ↑ Newman, Kenneth B. (2000). 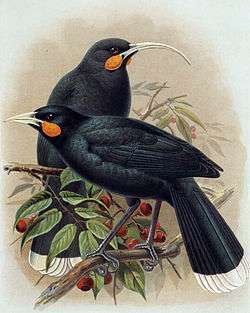 Newman's birds by colour. Struik. p. 14. ISBN 1-86872-448-4. ↑ Wheelwright, NT (1985). "Fruit size, gape width and the diets of fruit-eating birds" (PDF). Ecology. 66 (3): 808–818. doi:10.2307/1940542. ↑ Soler, J. J.; Avilés, J. M. (2010). Halsey, Lewis George, ed. "Sibling Competition and Conspicuousness of Nestling Gapes in Altricial Birds: A Comparative Study". PLoS ONE. 5 (5): e10509. doi:10.1371/journal.pone.0010509. PMC 2865545 . PMID 20463902. ↑ Hauber, Mark & Rebecca M. Kilner (2007). "Coevolution, communication, and host-chick mimicry in parasitic finches: who mimics whom?" (PDF). Behav. Ecol. Sociobiol. 61 (4): 497–503. doi:10.1007/s00265-006-0291-0. Archived from the original (PDF) on 2012-03-20. ↑ Sarah Hunt; Rebecca M. Kilner; Naomi E. Langmore; Andrew T. D. Bennett (2003). "Conspicuous, ultravioletrich mouth colours in begging chicks" (PDF). Biology Letters. 270: S25. doi:10.1098/rsbl.2003.0009. Retrieved June 27, 2010. ↑ Schuetz, Justin G. (October 2005). 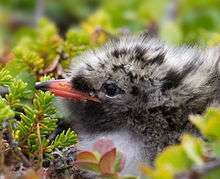 "Reduced growth but not survival of chicks with altered gape patterns". Animal Behaviour. 70 (4): 839–848. doi:10.1016/j.anbehav.2005.01.007. ISSN 0003-3472. ↑ Noble, D. G.; Davies, N.B. ; Hartley, I. R.; McRae, S. B. (July 1999). "The Red Gape of the Nestling Cuckoo (Cuculus canorus) Is Not a Supernormal Stimulus for Three Common Hosts". Behaviour. 136 (9): 759–777. doi:10.1163/156853999501559. JSTOR 4535638. ↑ Tanaka, Keita D.; Morimoto, Gen; Ueda, Keisuke (2005). "Yellow wing-patch of a nestling Horsfield's hawk cuckoo Cuculus fugax induces miscognition by hosts: mimicking a gape?". Journal of Avian Biology. 36 (5): 461–64. doi:10.1111/j.2005.0908-8857.03439.x. ↑ Zickefoose, Julie. "Backyard Mystery Birds". Bird Watcher's Digest. Retrieved 2010-06-25. 1 2 3 4 Campbell and Lack (1985), p. 375. ↑ Gellhorn, Joyce (2007). White-tailed Ptarmigan: Ghosts of the Alpine Tundra. Boulder, CO: Johnson Books. p. 110. ISBN 1-55566-397-4. ↑ Ehrlich, Paul R.; Dobkin, David S.; Wheye, Darryl (1998). The Birder's Handbook: A Field Guide to the Natural History of North American Birds. New York, NY: Simon and Schuster. p. 209. ISBN 0-671-65989-8. ↑ Carboneras, Carlos (1992). "Family Diomedeidae (Albatrosses)". In del Hoyo, Josep; Elliott, Andrew; Sargatal, Jordi. Handbook of Birds of the World, Volume 1: Ostrich to Ducks. Barcelona: Lynx Edicions. p. 199. ISBN 84-87334-10-5. ↑ Capainolo, Peter; Butler, Carol (2010). How Fast Can a Falcon Dive?. New Brunswick, NJ: Rutgers University Press. p. 51. ISBN 0-8135-4790-3. 1 2 3 Gill (1995), p. 117. ↑ Whitney, William Dwight; Smith, Benjamin Eli (1911). The Century Dictionary and Cyclopedia, volume 6. New York: The Century Company. p. 4123. LCCN 11031934. ↑ Bock, Walter J. (1989). "Organisms as Functional Machines: A Connectivity Explanation". American Zoologist. 29 (3): 1119–1132. doi:10.1093/icb/29.3.1119. JSTOR 3883510. ↑ Tudge, Colin (2009). The Bird: A Natural History of Who Birds Are, Where They Came From, and How They Live. New York, NY: Crown Publishers. p. 140. ISBN 0-307-34204-2. ↑ Kaplan, Gisela T. (2007). Tawny Frogmouth. Collingwood, Victoria: Csiro Publishing. pp. 40–41. ISBN 0-643-09239-0. ↑ Coues (1898), p. 151. ↑ Mike P. Harris (2014). "Aging Atlantic Puffins Fratercula arctica in summer and winter" (PDF). Seabird. Centre for Ecology & Hydrology. 27: 22–40. Archived from the original (PDF) on June 11, 2016. ↑ "Skomer Island Puffin Factsheet" (PDF). May 2011. ↑ Jupiter, Tony; Parr, Mike (2010). Parrots: A Guide to Parrots of the World. A&C Black. p. 17. ISBN 978-1-4081-3575-4. 1 2 Mougeo, François; Arroyo, Beatriz E. (22 June 2006). "Ultraviolet reflectance by the cere of raptors" (PDF). Biology Letters. 2 (2): 173–176. doi:10.1098/rsbl.2005.0434. ↑ Parejo, Deseada; Avilés, Jesús M.; Rodriguez, Juan (23 April 2010). "Visual cues and parental favouritism in a nocturnal bird". Biology Letters. 6 (2): 171–173. doi:10.1098/rsbl.2009.0769. ↑ Leopold, Aldo Starker (1972). Wildlife of Mexico: The Game Birds and Mammals. Berkeley, CA: University of California Press. p. 202. ISBN 0-520-00724-7. ↑ Alderton, David (1996). A Birdkeeper's Guide to Budgies. Tetra Press. p. 12. ↑ King and McLelland (1985), p. 376. 1 2 Elliot, Daniel Giraud (1898). The Wild Fowl of the United States and British Possessions. New York, NY: F. P. Harper. p. xviii. LCCN 98001121. ↑ Perrins, Christopher M. (1974). Birds. London, UK: Collins. p. 24. ISBN 0-00-212173-5. ↑ Petrie, Chuck (2006). Why Ducks Do That: 40 Distinctive Duck Behaviors Explained and Photographed. Minocqua, WI: Willow Creek Press. p. 31. ISBN 1-59543-050-4. ↑ Goodman, Donald Charles; Fisher, Harvey I. (1962). Functional Anatomy of the Feeding Apparatus in Waterfowl (Aves:Anatidae). Carbondale, IL: Southern Illinois University Press. p. 179. OCLC 646859135. ↑ King and McLelland (1985), p. 421. ↑ Dunn, Jon L.; Alderfer, Jonathan, eds. (2006). Field Guide to the Birds of North America (5 ed.). Washington, DC: National Geographic. p. 40. ISBN 0-7922-5314-0. ↑ Mullarney, Svensson, Zetterström and Grant (1999), p. 40. 1 2 Lederer, Roger J. "The Role of Avian Rictal Bristles" (PDF). The Wilson Bulletin. 84 (2): 193–197. 1 2 Conover, Michael R.; Miller, Don E. (November 1980). "Rictal Bristle Function in Willow Flycatcher" (PDF). The Condor. 82 (4): 469–471. doi:10.2307/1367580. 1 2 3 Cunningham, Susan J.; Alley, Maurice R.; Castro, Isabel (January 2011). "Facial Bristle Feather Histology and Morphology in New Zealand Birds: Implications for Function". Journal of Morphology (PDF). 272 (1): 118–128. doi:10.1002/jmor.10908. 1 2 Campbell and Lack (1985), p. 178. 1 2 Perrins, Christopher M.; Attenborough, David; Arlott, Norman (1987). New Generation Guide to the Birds of Britain and Europe. Austin, TX: University of Texas Press. p. 205. ISBN 0-292-75532-5. ↑ Clark, Jr., George A. (September 1961). "Occurrence and Timing of Egg Teeth in Birds" (PDF). The Wilson Bulletin. 73 (3): 268–278. 1 2 Gill (1995), p. 427. 1 2 3 Gill (1995), p. 428. ↑ Harris, Tim, ed. (2009). National Geographic Complete Birds of the World. Washington, DC: National Geographic. p. 23. ISBN 1-4262-0403-5. ↑ Kaiser, Gary W. (2007). The Inner Bird: Anatomy and Evolution. Vancouver, BC: University of Washington Press. p. 26. ISBN 0-7748-1344-X. ↑ Ralph, Charles L. (May 1969). "The Control of Color in Birds". American Zoologist. 9 (2): 521–530. doi:10.1093/icb/9.2.521. JSTOR 3881820. ↑ Hill (2010), p. 63. ↑ Rogers and Kaplan (2000), p. 155. 1 2 3 Jouventin, Pierre; Nolan, Paul M.; Örnborg, Jonas; Dobson, F. Stephen (February 2005). "Ultraviolet Spots in King and Emperor Penguins". The Condor. 113 (3): 144–150. doi:10.1650/7512. ↑ Thompson, Bill; Blom, Eirik A. T.; Gordon, Jeffrey A. (2005). Identify Yourself: The 50 Most Common Birding Identification Challenges. New York: Houghton Mifflin Harcourt. p. 128. ISBN 0-618-51469-4. ↑ O'Brien, Michael; Crossley, Richard; Karlson, Kevin (2006). The Shorebird Guide. New York: Houghton Mifflin. p. 76. ISBN 978-0-618-43294-3. ↑ Howell (2007), p. 21. ↑ Campbell and Lack (1995), p. 48. ↑ Parkes, A. S.; Emmens, C. W. (1944). "Effect of Androgens and Estrogens on Birds". In Harris, Richard S.; Thimann, Kenneth Vivian. Vitamins and hormones, volume 2. New York, NY: Academic Press. p. 371. ISBN 0-12-709802-X. ↑ Samour (2000), p. 7. ↑ Rogers and Kaplan (2000), p. 20. ↑ Rogers and Kaplan (2000), p. 79. ↑ Rogers and Kaplan (2000), p. 83. ↑ Tattersall, Glenn J.; Andrade, Denis V.; Abe, Augusto S. (24 July 2009). "Heat Exchange from the Toucan Bill Reveals a Controllable Vascular Thermal Radiator". Science. 325 (5949): 468–470. doi:10.1126/science.1175553. PMID 19628866. ↑ Greenbert, Russell; Danner, Raymond; Olsen, Brian; Luther, David (14 July 2011). "High summer temperature explains bill size variation in salt marsh sparrows". Ecography. online first: 146–152. doi:10.1111/j.1600-0587.2011.07002.x. ↑ Phillips, Polly K.; Sanborn, Allen F. (December 1994). "An infrared, thermographic study of surface temperature in three ratites: ostrich, emu and double-wattled cassowary". Journal of Thermal Biology. 19 (6): 423–430. doi:10.1016/0306-4565(94)90042-6. ↑ "Evolution of Bird Bills: Birds Reduce Their 'Heating Bills' in Cold Climates". Science Daily. 23 June 2010. Retrieved 12 March 2012. ↑ Bierma, Nathan (12 August 2004). "Add this to life list: `Birding' has inspired flock of words". Chicago Tribune. Retrieved 6 June 2011. ↑ Terres, John K. (1980). The Audubon Society Encyclopedia of North American Birds. New York: Alfred A. Knopf. ISBN 0-394-46651-9. ↑ Schreiber, Elizabeth Anne; Burger, Joanna, eds. (2002). Biology of Marine Birds. Boca Raton, FL: CRC Press. p. 325. ISBN 0-8493-9882-7. ↑ Armstrong 1965, p. 7. ↑ Wilson, Edward O. (1980). Sociobiology. Boston, MA: Harvard University Press. p. 227. ISBN 0-674-81624-2. ↑ Amerson, A. Binion (May 1967). "Incidence and Transfer of Rhinonyssidae (Acarina: Mesostigmata) in Sooty Terns (Sterna fuscata)". Journal of Medical Entomology. 4 (2): 197–9. PMID 6052126. ↑ Park, F. J. (March 2011). "Avian trichomoniasis: A study of lesions and relative prevalence in a variety of captive and free-living bird species as seen in an Australian avian practice". The Journal of the Australia Veterinary Association Ltd. 89 (3): 82–88. doi:10.1111/j.1751-0813.2010.00681.x. ↑ Partridge, Eric (2001). Shakespeare's Bawdy (4 ed.). London: Routledge Classics 2001. p. 82. ISBN 0-415-25553-8. ↑ Burton, Maurice; Burton, Robert (1980). The International Wildlife Encyclopedia, volume 12. New York: Marshall Cavendish Corp. p. 1680. 1 2 Grandin, Temple (2010). Improving Animal Welfare: A Practical Approach. Oxfordshire, UK: CABI. p. 110. ISBN 1-84593-541-1. ↑ "Bird Beaks: Anatomy, Care, and Diseases". Veterinary & Aquatic Services Department, Drs. Foster & Smith. Retrieved 16 April 2012. ↑ Ash, Lydia. "Coping your Raptor". The Modern Apprentice. Retrieved 16 April 2012. ↑ Cunningham, Susan J.; Alley, M. R.; Castro, I.; Potter, M. A.; Cunningham, M.; Pyne, M. J. (2010). "Bill morphology or Ibises suggests a remote-tactile sensory system for prey detection". The Auk. 127: 308–316. doi:10.1525/auk.2009.09117. ↑ Demery, Zoe P.; Chappell, J.; Martin, G. R. (2011). "Vision, touch and object manipulation in Senegal parrots Poicephalus senegalus". Proceedings of the Royal Society B. 278 (1725): 3687–3693. doi:10.1098/rspb.2011.0374. PMC 3203496 . PMID 21525059. Gilbertson, Lance (1999). Zoology Lab Manual (4 ed.). New York: McGraw Hill Companies. ISBN 0-07-237716-X.